Whether you’re a motorcycle collector, a new rider, or you just want to insure your kid’s brand-new bike, there are several reasons why you might want to purchase insurance without possessing a license. But can you get motorcycle insurance without a license? In this article, auto accident lawyer Brad Tabakin unpacks the most important insurance laws to give you an in-depth understanding of how and when you can purchase coverage. Mr. Tabakin is a seasoned personal injury lawyer and motorcycle enthusiast himself. He has spent his career defending biker’s rights, securing millions of dollars in settlements and verdicts for his clients. If you or anyone you know was injured in a motorcycle accident, call us today 877-333-0300 to schedule a free consultation. In most states, you will be required to purchase a policy meeting state-specific minimum coverage limits before you or anyone else can make use of your bike on the road. If caught, uninsured drivers can face severe penalties, from fines and license suspensions to jail time. Technically speaking, you don’t need a motorcycle license to purchase coverage; however, most insurers will request to see a valid motorcycle license number before approving your application for a policy. Unfortunately, while some insurers do accept learner’s permits, most will insist that you attach your coverage to a policy belonging to a valid license holder. Applying for a motorcycle license is usually a two-stage process. For example, in New Jersey, you will first need to obtain a motorcycle permit by filing an application, completing a vision screening, and passing a motorcycle knowledge test. 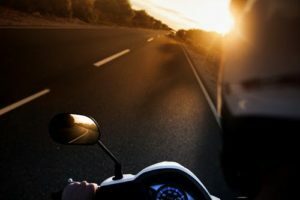 Then – depending on whether you already possess a regular driver’s license – you will either have to complete the New Jersey Motorcycle Safety Education Program’s Basic Rider Course or pass the New Jersey Vehicle Commission’s motorcycle road test. If you were involved in a motorcycle accident and you need legal advice, turn to motorcycle accident attorney Brad S. Tabakin. Call 877-333-0300 today to schedule a free consultation. And don’t forget to join our Facebook group to keep up with the latest developments in the Bikers Have Rights community.